Now it's time for kitsch costumes and spouting ketchup! 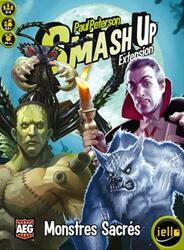 Smash Up cultivates its classics with four new Factions from the golden age of horror movies and propels you into the era of the sacred monsters of cinema. Terror, shivers and cardboard.... enough to make you crazy! Vampires pump the blood of other servants for more power, Giant Ants swarm like an indistinct and endless mass, Crazy Scientists tinker with spare parts to create strange creatures, and Werewolves unleash their destructive rage when the full moon invades the sky. Discover a new mechanism: Force +1 tokens that improve (surprise!) the strength of your creatures from 1 to infinity! This box allows 2 players to play immediately. But shuffle the new cards with any other Smash Up box and you'll get an even more explosive cocktail, for games with up to 4 players.